This term we have had the delights of learning walks and lesson observations by the senior leadership team. I had drawn the deputy head to come and observe me teach chemistry to my Year 7 group. From my planning, I realised that my lesson observation was going to be the first lesson of the new topic on “Elements, Compounds and Mixtures”. This is a nice topic to teach as there is plenty of scope for practical work for the students and for me to do some demonstrations. Being able to distinguish between elements, compounds and mixtures is essential to the understanding of chemical reactions. However, in my experience, many students in Key Stage 3 have a poor grasp of the differences between these three forms in particle terms but on a macroscopic level most demonstrate enough understanding to be able to write basic word equations to describe simple reactions. Not having taught lower school science for several years, I do know from past experience that most Year 7 students who have covered this topic area are able to recite that “elements are substances that contain only one kind of atom” and “compounds are made up of two or more different atoms that are chemically combined” but how much of this they actually understand is a different matter. For the majority of my Year 7 group it was going to be the first time they would encounter these key ideas so I decided to assume they knew nothing about the differences between elements, compounds and mixtures. I started my lesson with the word “chemistry” being broken down to the syllables, then vowels and consonants and then to the individual letters....these letters could not be broken down any further. It works well as an introduction to the idea of elements and all the students are able to relate to it. During the lesson the students were engaged with me or in the short task I had set. The “Element Song” by Tom Leher went down well - as always - and after 35 minutes the deputy head left with her clipboard whilst I continued with my demo to show sodium reacting with chlorine. The students were suitably wowed and you could almost hear the cogs turning in their heads as they processed the information I was giving. My lesson observation feedback was overall very good with one outstanding feature…I obeyed the no-hands up rule. One of the negative points was that it was too teacher-led. In my defence I did point out that I was teaching some fundamental chemistry introducing ideas that many students find difficult. 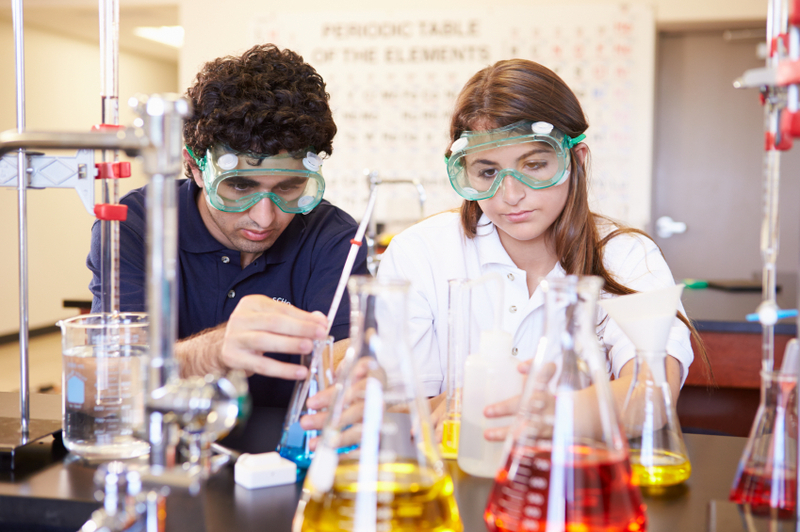 The report Beyond Appearances by the Royal Society of Chemistry highlights research on students’ misconceptions in 11 conceptual areas of chemistry; distinguishing between elements, compounds and mixtures being one of them. Sometimes it is necessary to be the “sage on the stage rather than the guide on the side”. So I overran on my teacher talk time…was it necessary? Yes it was; the students were hanging on my every word, enjoying their learning and asking some good questions. I needed to give them the depth of knowledge that was required for them to develop their thinking and understanding of the new ideas they had met in the lesson. It is not always appropriate for students in class to behave as if they are scientists to discover or conceptualise. Rather than recognising this, the observer (also a scientist) pointed out that more than 20 per cent of my lesson time was teacher–led and the students did not get the opportunity to discover the information themselves. She was disappointed that I had not taken note of what makes an outstanding lesson. I could see there was little point in pursuing my defence; I had failed in ticking that box. Perhaps I should alert my observer to the article in last week’s Saturday Times, Teacher colleges guilty of peddling myths and nonsense, minister says. I whole heartedly agree with Nick Gibb the schools minister, who said “it was important to debunk damaging theories that had pervaded classrooms and damaged educational achievement”. Teacher with an outstanding feature is a science teacher in West Midlands.